Newly Restored in HD and 3-D from 2K Scans! A married woman (Agnes Moorehead) takes her four unmarried redheaded daughters (Rhonda Fleming, Teresa Brewer, Cynthia and Kay Bell of The Bell Sisters) to Alaska during the 1898 Gold Rush so they could help their father run his newspaper. All four are members of the singing sister act The Edmonds Sisters, and upon arriving in Yukon they find out their father was murdered. The four heroines get work at the saloon owned by Johnny Kisco (Gene Barry). Kathie Edmonds (Fleming) searches for her father's murderer, who may or may not be Kisco. Hollywood veteran Lewis R. Foster directed this wonderful and colorful musical, which was the first ever 3-D musical and the first widescreen film released by Paramount Pictures. Bob Furmanek of the 3-D Film Archive was kind enough to share with me a final check disc (a clone of the actual retail product) for the upcoming Blu-ray 3-D release of the 1953 musical THOSE REDHEADS FROM SEATTLE for review. Kino Lorber, in association with the 3-D Film Archive, licensed the film for release from Paramount who supplied new 2K scans of the original left & right elements for final restoration by the 3-D Film Archives team. Note that as with all 3-D Blu-ray releases this is also view-able in 2-D on all systems. As usual for these reviews, I'm not going to comment extensively on the film itself. While no one would mistake it for an Arthur Freed MGM production, the film is still a winner based on the enthusiasm and energy of the performances. Gene Barry (who doesn't sing), Rhonda Fleming, Agnes Moorehead, Teresa Brewer, The Bell Sisters, and Guy Mitchell are charming and I enjoyed my time with them. Safe to say that if you enjoy musicals, you'll find much to like here even though there are only five or six musical numbers. The western mining town location offers considerable opportunity for outdoor action and interior decoration (a combination bar/music hall stage) for the cast to work in. What is of significant interest with THOSE REDHEADS FROM SEATTLE is the resulting 3-D Blu-ray experience and it's nothing short of terrific. It features wonderful depth with several fun off-screen moments (yes, including the dancers' legs - for once a movie poster didn't completely lie). As with the majority of the 1950's "Golden Age of 3-D" movies, the original stereoscopic photography (by Lionel Linden) is superb and features a marvelous use of depth-layering compositions to give a genuine "you are there" feel to many scenes. After viewing this disc - the first time I've seen the film in 3-D in about 10 years - I would place its 3-D photography in the top ten of the Golden Age. The restoration demo on the disc's special features presents the Archives' Greg Kintz detailing many of the problems they encountered while restoring this film. Just this before-and-after image should give you a small idea of the results, but there was much more done including vertical alignment (which reduces eyestrain), dust/debris cleanup (by Thad Komorowski), panel matching, etc. This section is easily my favorite part of the special features since it clearly shows how much work went into the restoration of the originally intended look of the film. There may be naysayers who claim that these Blu-ray 3-D restorations can't be performed at the budget the Archive works with, but the results on display here belie this view. The Blu-ray also features a newly-created lossless DTS-MA 3.0 reconstruction of the original three channel (left-center-right) stereophonic soundtrack plus, in a move which makes my purist heart happy, it also contains the original mono track in lossless form. Bob tells me that the original three channel sound was lost years ago, so audio engineer Eckhard Büttner took the original music and sound elements and was able to create a convincing stereo sound field from them, including some directional dialogue, The result is terrific, even in critical listening mode I wouldn't have guessed it wasn't the original stereo. There is none of that "electronically reprocessed for stereo" sound effect that we all hated on records from the 50s and 60s, nor did they try to create a modern booming 5.1 sound mix. What's there is natural-sounding to the era of the film's creation. This is an outstanding 1950s film soundtrack. Interview with Rhonda Fleming from 2006. Restoration demonstration, hosted by Greg Kintz (noted above), view-able in 3-D or 2-D. Audio commentary, featuring film historians Bob Furmanek, Hillary Hess, Jack Theakston. This is a very informative track that is the first commentary on a 3-D Blu-ray that concentrates on the 3-D production of the film as well as the history of the 3-D Film Archive. Greg Kintz joins at the intermission and provides additional details about both the film and the Archive's restoration efforts. An interesting item that Hillary picks up on is the extensive use of mirrors and windows in many shots, which really come alive in the 3-D presentation. Visual/audio demonstration of the three-channel stereo sound reconstruction. 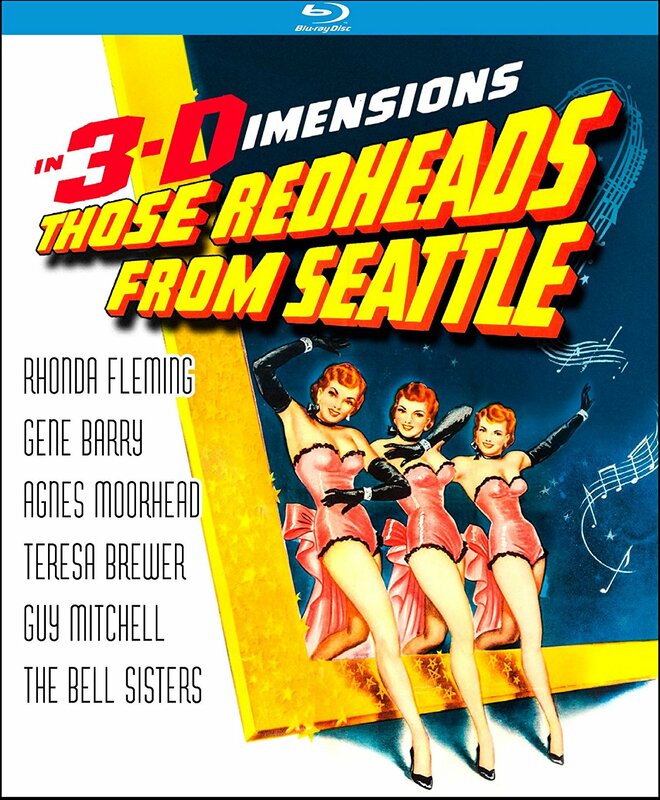 In case it's not clear from all of the above, I heartily recommend the 3-D Blu-ray of THOSE REDHEADS FROM SEATTLE. no lover of vintage 3-D will want to be without it. You'll find more historical information about the film and its release at the 3-D Film Archive's website HERE. Available for purchase from Amazon, Deep Discount, Best Buy, Barnes and Noble, Bullmoose, ImportCDs and most other online retailers, as well as direct from Kino Lorber. Street date is May 23, 2017; suggested retail price is $34.95. All images courtesy of the 3-D Film Archive. Reviewed on an Optoma HD50 DLP projector, custom-built 1.0 gain acoustically-transparent screen, Denon processor/amplifier, Polk and Paradigm speakers. 3-D viewed via Estar & True-Depth DLP-Link and Optoma RF glasses.